This model runs in OpenCell and COR and the units are consistent throughout. The output is similar to the original model simulation, but differs for unknown reasons. The CellML model translation is based on the the original model code which is available online at the JWS website. ABSTRACT: Everyone who has ever tried to radically change metabolic fluxes knows that it is often harder to determine which enzymes have to be modified than it is to actually implement these changes. In the more traditional genetic engineering approaches 'bottle-necks' are pinpointed using qualitative, intuitive approaches, but the alleviation of suspected 'rate-limiting' steps has not often been successful. Here the authors demonstrate that a model of pyruvate distribution in Lactococcus lactis based on enzyme kinetics in combination with metabolic control analysis clearly indicates the key control points in the flux to acetoin and diacetyl, important flavour compounds. The model presented here (available at http://jjj.biochem.sun.ac.za/wcfs.html) showed that the enzymes with the greatest effect on this flux resided outside the acetolactate synthase branch itself. Experiments confirmed the predictions of the model, i.e. knocking out lactate dehydrogenase and overexpressing NADH oxidase increased the flux through the acetolactate synthase branch from 0 to 75% of measured product formation rates. 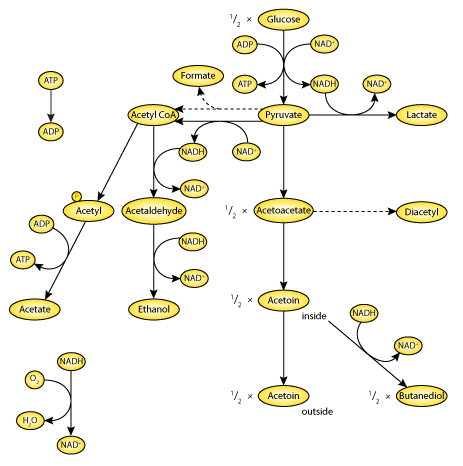 A schematic diagram of the reactions included in the model to describe the distribution of carbon from pyruvate in L. lactis. Derived from workspace Hoefnagel, Starrenburg, Martens, Hugenholtz, Kleerebezem, Vanswam, Bongers, Westerhoff, Snoep, 2002 at changeset 59cb833f3bb3.